I came home from a four day weekend trip to find my cherry tomato plants so heavy with fruit that they looked like the hunchback of Notre Dame carrying a pirate’s chest. What is a backyard-gardening-culinary-a-phile to do with a bumper crop of tomatoes? The 90-plus heat and the national anthem on the Giants (San Francisco, of course) broadcast, reminded me of a trip to D.C. a few years back and the wonderful first course gazpacho I had within protesting distance of the White House (G.W. Bush, of course). So I did a quick google search and found all the usual Italian inspired gazpacho recipes and decided to put my own spin on the classic cold tomato soup. Being from California, my palate and culinary skills are heavily influenced by south-of-the-border flavors and cuisine. First a few notes about the recipe. 1. Most recipes call for using tomato juice as a base and supplementing with fresh tomatoes. As you can see, the color of my gazpacho is not a deep dark red, because my goal was to use the fresh tomatoes I had on hand, not run to the store and buy tomato juice. If you need/want a darker red color, substitute some of the fresh tomatoes with tomato juice. 2. I am already thinking of experimenting with this recipe by adding or substituting jicima for texture and a more authentic flavor. 3. Use pre-cooked tortilla chips in place frying the corn tortilla yourself. Add 1 1/2 pints of the tomatoes to blender. Peel and dice the cucumber and red onion, add half to the blender and reserve the remaining in a bowl. Chop the scallions and add them to bowl of reserved vegetables. Seed and thinly slice the jalapeno then add to blender (add small amounts and taste if you are concerned with excess heat). Add salt, pepper and cilantro to the blender and liquify the contents. Taste and adjust salt, pepper and jalapeno. Fry corn tortilla to crispy, drain on paper towel then crush. 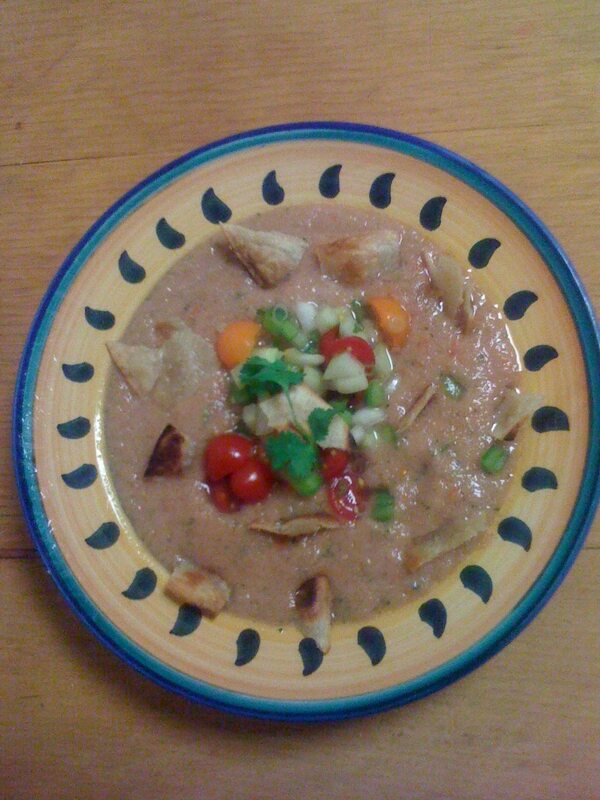 Pour blender contents into individual bowls, add reserved vegetables and crushed tortilla chips as garnish. Let me know what you think about this recipe, and any changes you made or suggest. Previous articleCancer Survivor – Part Two of Twelve: You’re a Cancer Survivor. Now What?